Just one word and it speaks volumes about who we are. 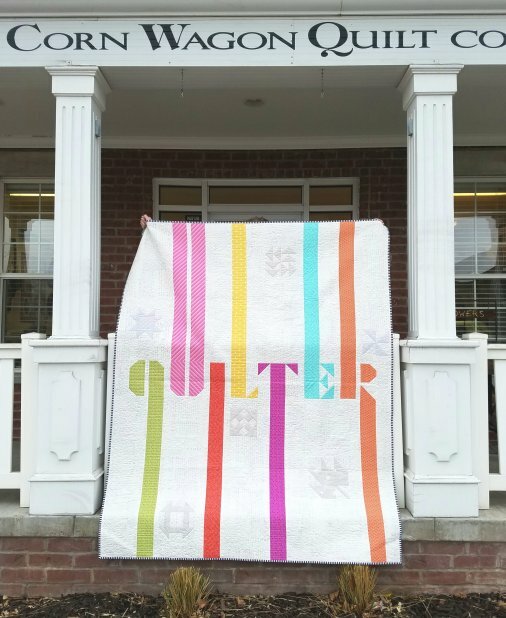 Local fabric and pattern designer, Emily Herrick, adapted one of her previous patterns (you might remember her "Gamer" quilt?) to create this fabulous modern statement quilt. Bold letters in a favorite color scheme stand out against a low-volume, grey and white script background. Barely-there, grey quilt blocks give a nod to the traditional heritage of quilting in a very modern way. Marsha spotted the finished quilt in Emily's home and said, "We must have it at the shop!" We are honored to have it on display along with kits and patterns. As always, the photo really doesn't do justice so be sure to stop in and see it in person!